"The train of time, Den-Liner. Would it be the next station is in the past or the future?" Ryotaro Nogami is a young man with a lot of bad luck. One day, he finds a strange pass and things got stranger from a mysterious girl and a large time-traveling train to being possessed by an entity called an Imagin, beings from an alternate future whose kind are attempting to change the past. Though slightly confused about the nature of the crisis, Ryotaro, along with the aid of the hot-headed, violent Imagin, dubbed Momotaros, becomes Kamen Rider Den-O, traveling to different times on the DenLiner to battle the evil Imagin to prevent them from altering the past to affect the present and future. During his adventure, Ryotaro is joined by other Imagin who aid him as well; the lying, manipulating and womanizing Urataros, the herculean (and narcoleptic) Kintaros, and the childish yet powerful Ryutaros. He later meets the mysterious Yuto Sakurai and his bumbling Imagin partner Deneb. Yuto is not only Kamen Rider Zeronos but is the younger incarnation of Ryotaro's older sister Airi's fiancé, Sakurai, who mysteriously disappeared and is tied to the mysteries involving the Imagin and a person known as the Junction Point. As shown in episode 27, Ryotaro pursues the Molech Imagin to May 8, 2000. 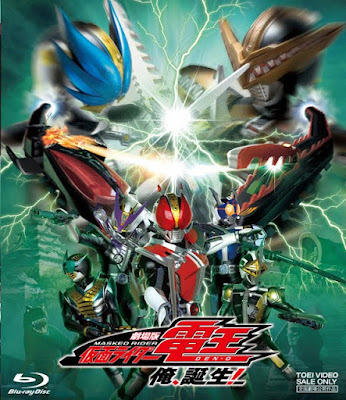 Though Den-O Sword Form destroys the Molech Imagin, the Imagin fulfilled his mission as the Den-Liner ends up hijacked by the rest of the Imagin led by a rogue Kamen Rider named Kamen Rider Gaoh. After stealing Owner's Master Pass and trapping Urataros and Kintaros, Gaoh forces the Den-Liner to travel back in time via "God's Line" to the Edo Period of Japan so he can retrieve the legendary God's Train, the Gaoh-Liner. Trapped in 2000, Ryotaro and Hana encounter Ryotaro's younger self at age 10 as well as their old friend, the Imagin Sieg. In order to prevent confusion between the two incarnations of Ryotaro, they call the younger one "Kotaro". By the time Yuto finds them, Ryotaro has lost his memory of everything related to Den-O. As a result, Momotaros cannot possess him, forcing him to take Kotaro as a host instead. However, Sieg's special talents allow him to still possess Ryotaro, offering his aid when the gang uses the Zero-Liner to pursue Gaoh, with Kotaro joining them. After being sent into the Mesozoic period by Gaoh, the gang arrived in the Edo Era and got Senhime's aid in sneaking into the camp of Yukimura Sanada who is aiding Gaoh. Though the reunited Tarōs defeat Sanada's ninjas, Gaoh succeeds in obtaining the Gaoh-Liner and travels forward to December 26, 1988, the day Ryotaro was born, to make an example out of Ryotaro. 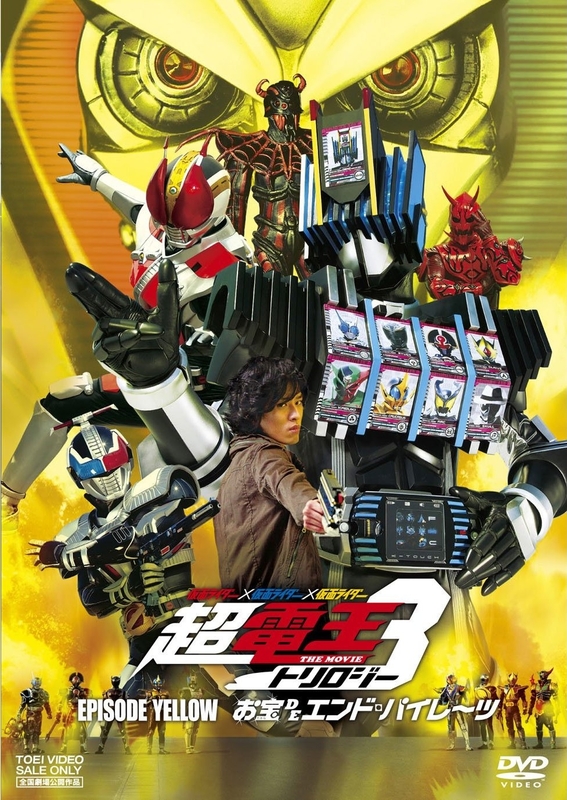 Ryotaro and Momotaros are forced to fight him and his band on his own until Yuto arrives with the past Ryotaros he borrowed for the "Climax Scene". After the long battle, the Den-Os and Zeronos emerge victorious as Gaoh is destroyed by Sword Form. On the return trip back to his own time, the Den-Liner comes across Ryotaro's old house as Ryotaro finally gets to see the face of his parents for the first and last time. Sieg and Kotaro also return to their respective timelines as well, resuming their places in history. When Ryotaro returns to the present, he finds a drawing of his parents in the picture frame where the original photo once was. Set after the events of Kamen Rider Den-O, Ryotaro and the Den-Liner gang have set up a detective agency called the Den-Liner Police (デンライナー署 Denrainā Sho) who seek to keep the Imagin that survived the Junction Point in check after an Imagin stole a spare Den-O Pass from Owner while he was training. While pursuing the Pink Rabbit Imagin via car chase, they cross paths with the Horse Fangire as Den-O and the Tarōs battle them, killing the two monsters and not finding the Den-O Pass on either. Soon after, the Den-Liner Police are joined by detective Kazuya Suzuki, who tells them of an "Evil Organization" that is making itself known in the criminal underworld. After R-Ryotaro's "arrest spree", Ryotaro and Kazuya encounter Wataru Kurenai and Shizuka as they are suspiciously digging up items for a new violin varnish. After a small spat with U-Ryotaro and an unintentional possession of Wataru by Momotaros, Ryotaro and Kazuya locate the base of the Evil Organization after Wataru tips them off. There, before being chased out, they find Yuto with the organization's leader, the Imagin Negataros, and a man that Kazuya recognizes as wanted criminal Seiya Kuroki. Acting on his own, Kazuya attempts to arrest Kuroki, only to be ambushed by the Clown Imagin. However, with a drunk Deneb and Naomi as a distraction, Yuto, who has been working incognito, attempts to free Kazuya. Before he can ambush Sarah with a metal bat, he is possessed by Urataros who manages to successfully woo her and wrest the gun away. Yuto kicks Urataros out as he fights her and the Clown Imagin as Kuroki arrives, with K-Ryotaro providing backup. Negataros takes his leave while activating the detonation device with everyone making it out. At the Den-Liner, after Kazuya apologizes for almost getting everyone killed and explaining his reasons to be avenging his father Kazuma, Yuto reveals Negataros's plans. Despite telling them that he's too strong, the Den-Liner Police decide to attack at full strength together. 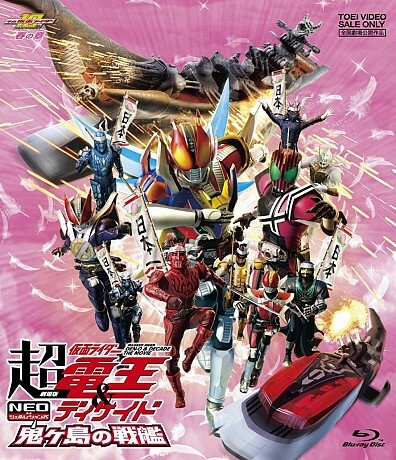 The next day, Negataros begins to set his plan in motion with Kamen Riders Den-O and Zeronos, along with their Imagin partners, standing in his way while Suzuki arrests Kuroki after the Den-Liner takes him and his posse away from the fight. However, Negataros uses the Den-O Pass to become Nega Den-O as the fight begins. As the Tarōs deal with the Fangires, Zeronos battles the Clown Imagin while Den-O dukes it out with Nega Den-O. Nega Den-O easily gains the upper hand against all four Den-O forms, but before he can finish him off, Kamen Rider Kiva arrives to turn the tables as Den-O Climax Form joins him in a Double Rider Kick. The impact forces Negataros out of his Rider form. Refusing to accept defeat, Nega Den-O escapes in the Nega Den-Liner with Den-Liner and Zero-Liner in pursuit. Castle Doran joins the fight as all three giants destroy the Nega Den-Liner, taking out Negataros for good. Soon after, Ryotaro takes Kazuya to 1986 to see Kazuma as he was interviewing Otoya on an investigation, giving the young detective closure. Though they succeeded in their mission to stop Negataros, Momotaros decides to keep the Den-Liner Police going as he considers being a cop a cool thing. After they succeed in cornering a couple of crooks, Deneb attempts to ask for Yuto to join the Den-Liner Police, failing to see the crooks they cornered escape with the Den-Liner Police and Yuto chasing after them. Taking place after the events of series, the Tarōs and Kohana go out of the Den-Liner for a day to visit Ryotaro and Airi. However, they see the mysterious Ghost Train that has been mentioned in urban legends as Momotaros and gang are then attacked by two evil Imagin and Kamen Rider Yuuki Skull Form. During the fight, it is revealed to the Tarōs that Yuuki is none other than Ryotaro possessed by an evil Imagin. Even with Kamen Rider Zeronos coming to the gang's aid, things seem bleak until a blue DenLiner appears with a new figure: Kamen Rider New Den-O. After destroying the Shadow Imagin, with Yuuki and the Phantom Imagin retreating to the Ghost Train, the gang is brought onto the New DenLiner. There, Owner formally introduces the new Rider as Kotaro Nogami, Ryotaro's grandson from the future, and his Imagin Teddy. After Owner reveals he summoned Kotaro in respose to a threat posed by the Ghost Train and its owner Shiro, who seeks to use the Ghost Train to reverse the worlds of the living and the dead. After Kotaro explains to Momotaros that intends to pick up the slack for his grandfather, whom he has no respect for, he goes after the Ghost Train by himself as New Den-O to fight Yuuki after killing the Phantom Imagin until Shiro arrives and defeats New Den-O personally. Yuuki is about to kill Kotaro when Ryotaro attempts to regain control over his actions as the Taros arrive. 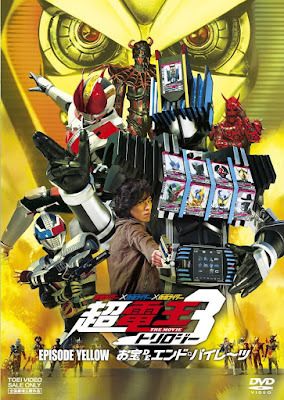 Although Shiro and Yuuki escape, the New DenLiner crew get a Rider Ticket and a partial message from Ryotaro to Momotaros about protecting an "elephant" that leads them to where Shiro intends to carry out his plan: May 23, 1729. There, the New DenLiner gang learn they have reinforcements in both Sieg and then Deneb, who joins up with the gang in Yuto's stead as he is still injured from the fight with Yuuki. After looking for clues, encountering people who resemble Airi, Ozaki, and Miura, and unable to find any elephant except a traditional drawing of one in the middle of the town taken from a future point in time, the rest of the group questions whether or not Momotaros heard things right. During their dinner, Kotaro takes his leave as Momotaros follows him in an attempt to talk to him about how he strong is like his grandfather, but Kotaro has yet to see his grandfather in any way resembling someone "strong". Later that night, Teddy discovers Shiro's plan to kill everyone in the village the next day, but is found out and attacked. He struggles back to their base of operations so his friends will know and says how the "elephant" is not really an elephant. Although New Den-O is without his partner and Yuto is still injured, Momotaros decides to get Ryotaro back even if it is the last thing he does. The next day, the other Tarōs and Deneb battle the mercenaries as Momotaros fights his way to Yuuki, attempting to call out of Ryotaro to fight his possessor before getting a mortal wound from Yuuki to his friends' horror. But at the last second, Ryotaro regains control as Momotaros enters his body and drives the Ghost Imagin out of him. Assuming Climax Form, Den-O easily takes out the Ghost Imagin as Shiro takes the Yuuki Belt and assumes Yuuki Hijack Form as he uses his necromancy to summon every Imagin the Riders have ever faced back from the dead. After Climax Form is defeated, a fully healed Yuto and Kohana arrive via the ZeroLiner and New DenLiner, with Kohana giving the Tarōs and Sieg their own Rider Passes. The Imagin each assume their Den-O forms as Ryotaro becomes Liner Form and Yuto becomes Zero Form. While the others battle the Imagin, Liner Form, Sword Form, and later New Den-O pursue Yuuki on horseback. Together, the three Den-O's mortally wound Yuuki who reverts back to Shiro. Sora arrives, revealing to everyone else that she had been dead for 400 years and did not wish to be alive again, only to be with Shiro for eternity. Accepting his fate, Shiro and Sora board the Ghost Train to be together forever in the realm of the dead. When the New DenLiner arrives in the middle of town to pick up the gang, Naomi questions being out in the open while Owner reveals that the locals will only recognize it as an elephant. Ryotaro also reveals that he was aware of the "elephant" as it was the point in time where his ancestor Oyuki finds her true love. It is this point in history that Shiro planned to negate, preventing Ryotaro from ever existing and allowing him to bring Sora and everyone else who had died back to life. With his mission complete, Kotaro gains a new respect for his grandfather as he and Teddy are brought back to their time via the DenLiner, where they meet up with the elderly Ryotaro of their future. Meanwhile, in the year 1980, a boy named Yu encounters Mimihiko and then Yu is possessed by Deneb who gets him away from the Gelnewts before New Den-O arrives to cover his escape. Deneb then brings Yu to Ryotaro, revealing Mimihiko to be one of the Oni of legend and is searching for the Trump Stone which Yu possesses. Seeing Yu reluctant to give them the item, Ryotaro leaves him with a DenLiner admission ticket should he change his mind. The next day, Yu runs off after learns that his father wants him to leave with him. Learning he is hunted by the Gelnewts, Yu tries to outrun the monsters on his bike before managing to reach the sands of time where the DenLiner is waiting for him. Giving them the Trump Stone, Yu wishes to be remain on the train. Though Owner warns him their intent to go back in time to fight the Oni, Yu refuses to turn back. 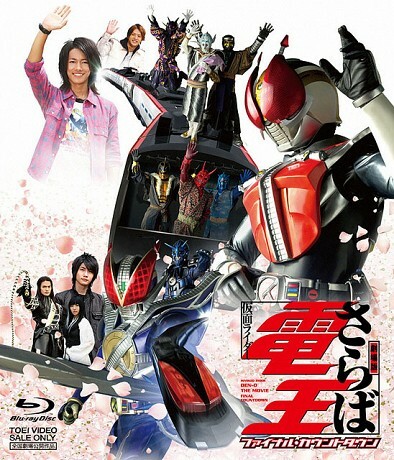 After Yu is informed on the effects the distortions had on Ryotaro and Yuto, the former regressed to a child while the latter has mysteriously disappeared, the DenLiner arrives at the Junction Point where they meet the Station Master who reveals a 1936 newspaper documenting that Urataros, Kintaros, and Ryutaros caught a band of rice thieves; they have been possessing the bodies of another trio named Jiro, Ramon, and Riki (the Arms Monsters of Kamen Rider Kiva). Traveling to that time, the kids find Tsukasa who offers his aid. Kotaro is reluctant to accept his help until Tsukasa reveals the scroll Sieg brought with him that has Momotaros on it. Arriving in the Muromachi period, DenLiner gang arrive and defeat the Gelnewts, meeting Toki and joining her at the village's pleas. Once at Onigashima, New Den-O and the villagers catch the Gelnewts off guard as the kids find Momotaros. Deneb asks Yu to form a contract with him, at least until Yuto returns, to be able to assist the others in. Den-O and Deneb join the fray as Kuchihiko arrives and assumes his Rider form Goludora. During the fight, Toki takes a hit meant for Yu before New Den-O is defeated. Using Kotaro as a bargaining chip, Goludora gives them a day to accept his demands for both the Trump Stone and the DenLiner. The next day, after planning it out, the DenLiner gang gives up both the Trump Stone and the DenLiner. Once the Owner and Naomi are evicted, Kuchihiko ditches Kotaro as he enters the DenLiner to reach his brother in the present time period. However, his journey is staged as the evicted "Owner" is the Station Master in disguise as the real Owner pulled the emergency break as everyone else has erected a massive set designed to look like modern Tokyo. 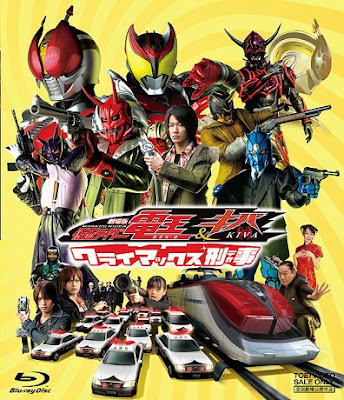 Once the DenLiner staff and the Station Master enter the train, with Kohana guarding the door, Den-O, the Tarōs, and New Den-O battle Goludora and the Gelnewts with Toki providing backup, until she is wounded in battle. However, Diend appears long enough to summon Kamen Riders Ouja, G3, and Caucasus as wild cards in the fight and Kuchihiko reassembles the Oni's Trump Stone with Mimihiko activating the Demon's Warship in the present and using it to return to the past. The Oni Brothers are able to defeat them until Tsukasa and Sieg arrive, allowing Den-O to assume Wing form as Momotaros possess Tsukasa to fight as Decade. The other Tarōs do the same with Diend's summoned Riders (Urataros with G3, Kintaros with Caucasus, and Ryutaros with Ouja) while Deneb enters Kotaro, enabling Kamen Rider New Den-O to assume Vega Form. Helping Toki fire her arrow, Yu manages to break the Demon's Warship’s anchor to give the Kamen Riders time to set up a way to end the fight. At Decade's suggestion, Ryotaro forms Kamen Rider Den-O Super Climax Form with the Tarōs and Sieg. Cho-Den-O and Decade manage to overwhelm the Oni Brothers with New Den-O Vega Form and Teddy's aid. 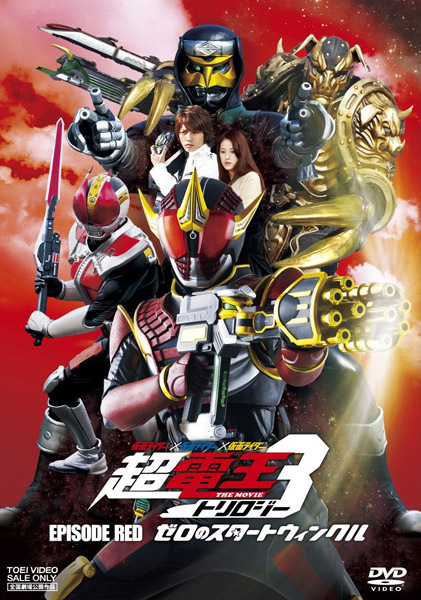 After Shilubara sacrifices himself to protect his brother, an enraged Goludora enters the Warship and engages the DenLiner in a battle with Decade taking his leave as the DenLiner gang manages to sink the Warship from the inside out as Kamen Rider Den-O Sword finishes Goludora off with a Rider Kick. Soon after, Yu bids farewell to Toki as she is revealed to be his ancestor. Though offered a slight detour before they return to present, Yu turns it down as he wants to be back in his time. After they part ways, Deneb is dropped back in 2009 where he finds Yuto Sakurai waiting for him, where he reveals that he went by the name Yu as a child and they return to the ZeroLiner. After a review of the love between Yuto Sakurai and Airi Nogami, with the man sacrificing his existence to help his past incarnation act as Kamen Rider Zeronos in order to protect both Airi and time itself, scene opens to Airi and Ryotaro are renovating the Milk Dipper. Seigi Ozaki and Issē Miura arrive while Ryotaro is suddenly possessed by Momotaros who spirits him off while telling him that the DenLiner has been hijacked by an Imagin. But on the way, M-Ryotaro senses two thugs attacking Airi during her walk and arrives in time to beat them out of thinking they are in league with the Imagin, only to hear that a young man put them up to it. Seeing Yuto leaving the scene makes it more confusing as M-Ryotaro loses him before Urataros calls that the DenLiner stopped thanks to the manual breaks. When Ryotaro gets to the DenLiner, he learns the card the Imagin put in the DenBird had no clear date and causes the train to travel anywhere within the month January 2010. Furthermore, as the Owner of the DenLiner reassures the passengers, the time train would eventually crash if the bakes fail. When Momotaro accuses Yuto of being behind it, Deneb appears from the passenger car to explain he engineered a kidnapping so Yuto can be with Airi. But the plan never occurred as Yuto kicked him out the ZeroLiner upon hearing the plan. When the DenLiner's brakes start to fail, the Owner sends Ryotaro and the Tarōs to anchor the train to May 2010 by tying it to a concrete block outside of the sands of time. Back at the Milk Dipper, two thugs appear at the Milk Dipper to intimidate Airi, but Yuto appears just in time to save her. He is about to leave when Airi offers him sweet coffee. From outside, the mastermind of the two attacks, Hiroshi Kikuchi, fumes that his plan to save Airi failed as Piggies Imagin mocks him while reminding him if their a contract where Kikuchi is promised the chance to impress Airi and gain her love. Sensing the Imagin, Momotaros is unable to act as he hurt his back from working. Urataros possesses Ryotaro and finds the Piggies Imagin, fighting him as Den-O Rod Form before Deneb arrives for support as Piggies Imagin spirits Kikuchi. After Urataros, Ryotaro and Deneb return to the Milky Dipper as they find Yuto and Airi talking before the latter laments how she may never be with Sakurai as the former knows he wants to see her again. Deneb takes it hard before he meets up with Yuto to apologize before he gets a plan to fix everything while the Piggies Imagin plans his own scheme. Leaving for his time as the Owner measures everything in response to a call from the Station Master, Ryotaro leaves to find the ropes anchoring the DenLiner to May 2010 snapping, leaving the boy on his own to find the Imagin and contract holder. The next day, with Ozaki and Miura acting as her bodyguards, Airi is taking a walk until the Piggies Imagin knocks them out and kidnaps her. Arriving to her aid, Ryotaro assumes Den-O Plat Form to save her, only to be easily defeated as Yuto becomes Zeronos Zero Form to fight the Piggies Imagin. But when the Imagin reveals he intends to kill Kikuchi if this scheme fails, Zeronos is forced to take a fall. However, unable to follow the plan, Kikuchi is forced to see Imagin throw Airi into the back of the truck and claims that his contract with Kikuchi is complete. However, unable to prove himself a hero, Kikuchi drives off with the Imagin jumping after him. Zeronos follows the truck in the ZeroLiner for some time before switching to the ZeroHorn while Ryotaro chases foolishly until he finds Momotaros dressed as a homeless man. Momotaros is overjoyed by this and hugs Ryotaro as Ryotaro comforts him. Momotaros reveals he jumped out of the DenLiner while it was in January 12, 2010 and had been living under a bridge with some homeless people for four months. He also mentions how he first witnessed Kikuchi becoming enamored with Airi at the time before joining Ryotaro in his chase after the Imagin. Still chasing the truck, assuming Vega Form, Zeronos uses ZeroLiner Naginata to knock the Piggies Imagin off of the truck as Ryotaro and Momotaros arrive and transform into Kamen Rider Den-O. By then, as Den-O Sword Form is outmatched with an attack to the back, the DenLiner is brought back under control by the KingLiner. With Urataros, Kintaros, and Ryutaros, Den-O transforms into Climax Form and uses his Extreme Slash to easily destroy the Piggies Imagin. Meanwhile, when the truck's brakes are no longer working and heading to a cliff, Zeronos transforms into Altair Form to save Airi, leaving Deneb on the ZeroHorn. With Airi in his arms, the two leap out of the truck as Deneb shoots at its tires to turn it onto its side before it reaches the cliff, saving Kikuchi as well while Airi comes to see Yuto looking over her. As Yuto takes Airi back to town, Deneb heads to the DenLiner as he laments failing Yuto in getting Airi's love as Ryotaro assures him that might be someday. Using the ZeroHorn to take Airi back to town, Yuto stops as they see the starry sky and Airi realizes that Yuto was the man she used to love. At the Time Terminal, the PA system announces to the patrons of the Time-Crossing Flea Market that a ticket thief has been appearing over the past few days, and that they should keep an eye out. The thief appears, defeating several security guards while getting several time tickets, including one dated for June 10, 2010. Arriving to the present, the thief is cause off caught by Ryotaro as he becomes Den-O Sword Form. During the fight, the thief is revealed to be the Mantis Imagin as she strikes Den-O's ankle to cripple him as DenLiner saves Den-O before his opponent could finish him off. With Momotaros and Ryotaro unable to continue, the Owner reassures the DenLiner crew that they still have hope as Sieg arrives. The Owner clarifies that Sieg is not the one he summoned, but Kotaro and Teddy who are investigating the crime scene at the Time Terminal. Before they leave, after saving Kotaro from numerous cases of bad luck, Teddy spots something in one of the Time Terminal's stands: a good luck necklace that has a pendant of two interlocked stars. Arriving to the DenLiner as it docks, Kotaro learn from the Owner that his contract with Teddy is complete as the contract, and now the Owner needs his assistance due to his special nature. Teddy reluctantly agrees, taking on the name "Aleksandrovic" to go with the change of contract. Kotaro leaves the DenLiner to continue after the Mantis Imagin, with no one to protect him from his bad luck. Arriving to the Milk Dipper, Kotaro overhears Airi, Seigi Ozaki, and Issē Miura discussing about a girl named Miku Uehara who saw a doppelganger of herself. Kotaro has an elephant-costumed Kintaros arrives to Miku's house as he finds the girl with her grandmother and the "doppelganger", the latter with sand pouring from her body. By then, the Mantis Imagin decides to intervene by distracting Kotaro to drive him away from the family. After Kintaros possesses him to reduce the bad luck inflictions, Kotaro becomes New Den-O to fight the Mantis Imagin with Kintaros as the Kintaono axe. But the Kintaono is too heavy for New Den-O to wield as Mantis Imagin beats them before taking her leave. Back on the DenLiner, while Kohana tends to Kotaro's injuries, the Owner orders "Aleksandrovic" to polish the special spoons they found. When Ryotaro asks about a way for Teddy to help Kotaro again, the Owner explains that any derailment from his current contract could destroy the Imagin. Though, Kotaro accepts as he decides to investigate the two Mikus, with Ryutaros possessing Kotaro in the process. Arriving at the grandmother's house, R-Kotaro discovers that the grandmother is testing the two Mikus to see which of the two is the real Miku by having both make asazuke. Though R-Kotaro points out that the second cannot be real due the sand pouring from her, the grandmother explains that she will decide. After a tie from the cooking, the two Mikus play tennis. As Ryutaros goes off to play on his own, leaving him to realize that Teddy protected him from his bad luck and he took him for granted, Kotaro ponders what is going on until the Mantis Imagin deems the contract completed. Luckily, the DenLiner arrives in time pick up Kotaro and the second Miku and drop off Ryotaro who joins with Ryutaros to become Den-O Gun Form. While glad that the other girl is gone, Miku leaves to her grandmother's dismay. On the DenLiner, the second Miku reveals that she is from the not too-distant future that came to spend her birthday with her grandmother before she dies. Her sad story reaches Kotaro and Teddy as Ryutaros is knocked back into the DenLiner, with Ryotaro at the Mantis Imagin's mercy. Seeing Teddy about to derail from his contact, Kotaro tells Miku he understands her plight before going off with Urataros, using him as the Uratazao rod to fight the Mantis Imagin. But the Mantis Imagin defeats New Den-O once more. On the DenLiner, as future Miku runs off after being told the consequences of her contract, Teddy leaves as well as he would rather protect Kotaro even if he may disappear forever. Saving Kotaro from the Mantis Imagin on the New DenBird as future Miku returns to her grandmother's house, Teddy and Kotaro admit their bonds of friendship before transforming into New Den-O and the Macheteddy and together they fight the Mantis Imagin in the moonlight, finally beating the Imagin before destroying her with his Counter Slash. Soon after, Teddy fades from existence as he gives Kotaro the good luck pendant he bought to symbolize their friendship, only for Kotaro realize it to be a love charm. Back on the DenLiner, everyone is saddened as the Owner arrives with a new Imagin partner for Kotaro: "Aleksandrovic". With the others shocked, the Owner reveals Kotaro's friendship with Teddy saved him and restored their contract. Though the others were confused by the whole point of the Owner's actions, along with Sieg’s appearance, Kotaro believes it was to teach him a valuable lesson as he and Teddy are returned to their time. While that occurs, future Miku spends her time with her grandmother who assures her the future would not be bleak after knowing her true nature. Returning to her time, August 25, 2010, Miku finds a note from her grandmother thanking her for the memories she gave her as the wind chime Miku got for her birthday jingles in the background. At night in Tokyo, a man jumps from building to building, leaving sparkly sand as he moves. Momotaros and the other Tarōs pursue him, with Momotaros thinking he met him before as the figure easily dispatches his pursuers. When Ryotaro arrives, the Spider Imagin possessing the man emerges, having completed the contract with the boy's appearance. Ryotaro uses a Rider Ticket on the man, chasing the Imagin to November 22, 2008, with Den-O Sword Form quickly taking the Spider Imagin out. 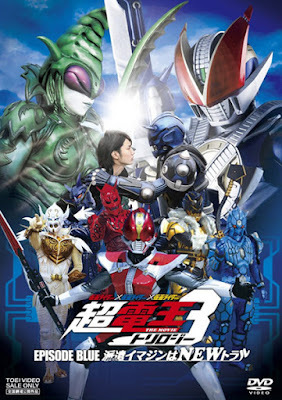 As Momotaros and the others look around for the Rider Pass he tossed aside while performing the finishing attack, they see the possessed man from before holding it, revealing that he used the Spider Imagin to possess him so he could hijack the DenLiner as Momotaros remembers who this man is: "that robber rider" Daiki Kaito. 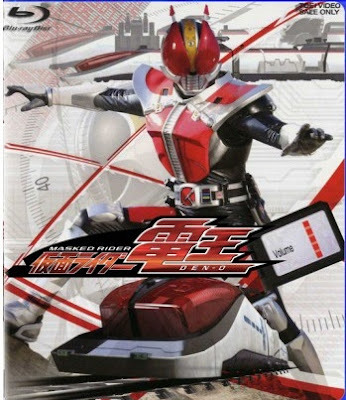 Stranding Ryotaro and the Tarōs in 2008, Daiki holds the Owner and Naomi at gunpoint as the Owner reveals his plans to steal time failed as the DenLiner can only go to the date on the ticket as it as a strong memory that keeps it from fading. Realizing that there is a treasure nearby, Daiki runs off to find it. Seeing the DenLiner over the distance, Ryotaro and the Tarōs chase after it until Ryotaro sees Daiki running off in another direction. He finds Daiki confronting his past self, shooting him dead to Ryotaro's shock. However, past Daiki's wound heals as he runs off with Daiki shooting him more. Soon as the Tarōs arrive, a man suddenly appears from another point in time with a golden revolver trained on Daiki, Officer Reiji Kurosaki. He has come to arrest Daiki for threatening to cause a time paradox before transforming into Kamen Rider G Den-O as Daiki responds by becoming Kamen Rider Diend. Ryotaro and the Taros watch G Den-O as he overwhelms Diend with his advance arsenal and the intelligence of the artificial Imagin Eve before arresting him. However, with the Time Police taking over, G Den-O arrests the Tarōs on the charge of altering time and deporting Ryotaro to his time. Only Urataros escapes long enough to witness past Daiki stealing a briefcase from the Kurosaki estate, pushing aside a young boy who got in his way, before G Den-O finds him. Back in the present time, as Issē and Ozaki look at the drawing Ryotaro made of their family, Ryotaro talks to Kohana of what Urataros told him prior to his arrest. Overhearing their talk, Ozaki remembers a theft occurred at the Kurosaki estate on that date: someone broke in and stole the family's golden gun. But it leaves the question to why Daiki went to that moment of his past. At the Time Police's jail, the Imagin try to talk their way out as Daiki complains about their nosy racket as Urataros reveals he know about his robbery. By then, Kurosaki arrives with two guards, ignoring the Taros while telling him the will be judged while phrasing what Urataros heard Daiki tell a young boy in the past. By then, the Owner appears to bail the Taros before being arrested as an accomplice with the DenLiner now Time Police property as Daiki manages to grab one of guards, faking a wish to give up his life of crime to sneak the keys off the man and using them to frees himself, throwing the keys to the Imagin a bit out of reach. After failed attempts to get the keys, they see Ryotaro and Kohana have been arrested as well, and put into the cell next to the Tarōs who are still trying to reach the keys. Ryotaro beckons for Momotaros to come closer, which Momotaros realizes what is being said as he possesses the boy, beating the guards with Kohana as she lets everyone free. Ryotaro says they still have to get to the DenLiner, and the Owner gives him an Infinity Ticket to solve the mystery while he has a meeting with the Station Master. On the DenLiner, Naomi arrives to tell Kurosaki that Daiki has escaped. However, Kurosaki senses something off and aims his damaged golden gun at "Naomi," revealing her to be Daiki. Daiki then takes of his Naomi disguise as he is forced off the DenLiner at gun point and clearance to execute. Daiki attempts to distract Kurosaki by pointing that Ryotaro and company are behind him as the DenLiner crew takes control of the DenLiner once more and return to November 22, 2008. Daiki has used the Diendriver to latch onto the back of the DenLiner, traveling with them as Eve deems them all for execution. Diend manages to get to the DenLiner's cockpit and holds Den-O at gunpoint, forced to explain that the purpose of his time trip was to undo the chain of events that left the gun damaged while Daiki was distracted by several letters hidden in the box so he can steal it in mint condition. Though the others refuse to help, Ryotaro decides to help Daiki with Urataros backing it up. Arriving at November 22, 2008, the group is ambushed by G Den-O as Den-O holds him off in his Ax and Gun Forms before Momotaros takes over the fight. With Urataros possessing him to save him, Daiki transforms into Diend and uses the UraRod to deflect bullets back before using the Invisible Attack Ride Card to catch G Den-O off guard. By them, Daiki manages to make it to where his past self is before the gun is damaged, though Kurosaki appears. Before Daiki can get to his Diendriver once more, Kurosaki shoots him with the golden gun. The bullet goes through Daiki and hits the case the past Daiki is carrying, knocking it out of his hands, sending the papers within flying as Daiki gets the golden gun. Enraged that he was used, losing his golden gun as time has been altered so that it was never damaged and possessed by Daiki, Kurosaki stopped when he noticed the letters from the box. Daiki and Kohana reveal the letters to all to be from his mother, with the latter revealing to Kurosaki that his mother did loved him and wishes to see him. Though Kurosaki feels he cannot let go of his hate, Daiki tells him that the letters should be his treasure. Disappointed that Kurosaki refuses to deliver final judgment, Eve takes matters into his own hands and becomes G Den-O to purge the Earth of all illogical life. Everyone escapes from G Den-O as Daiki runs into his past self and asks for his aid against G Den-O. Both transform and past Diend steals the golden gun as he falls back. Den-O arrives to support Diend with the others. But the five are outmatched by G Den-O until Den-O assumes Climax Form as Kurosaki arrives with Diend saving him from a stray shot. Kurosaki thanks Diend for opening his eyes as he gives him a K-Touch which he soon uses to become Diend Complete Form. He then uses the Attack Ride Gekijouban Card to summon Kamen Riders G4, Ryuga, Orga, Glaive, Kabuki, Caucasus, Arc, and Skull, and as a group with Den-O Climax Form, destroy Kamen Rider G Den-O. In the end, before entering the Hikari Photo Studio, Daiki thanks Ryotaro and Kohana for their help as Kurosaki goes to visit his mother at a flower shop, wanting to talk to her as he learns that she truly cared for him. On the DenLiner, as the others are perplexed as the Owner arrives with the Station Master as they start a contest where they are flicking balls of fried rice at plates at distances with the Owner using the spoons from Episode Blue used as a golf club while they measure the distance with the tape from Episode Red. Soon after, Naomi serves everyone coffee as Ryotaro's regular mug is missing, realizing that Daiki must have taken it. Back at the photo studio, though he believes that would be their last meeting, Daiki would never forget Kamen Rider Den-O.